Why Is A Pulmonary Embolism Life Threatening? Why is a Pulmonary Embolism So Dangerous? A pulmonary embolism is life-threatening because it is a sudden blockage or occlusion of the pulmonary arteries in the lungs caused by an embolus. This embolus in the pulmonary artery will cause a collapse of the circulatory system. Blood clots originated in other parts of the body, usually legs, dislodge and flow through the bloodstream (embolus), arriving at the right side of the heart (right atrium and ventricle) and blocking one or more lung arteries, which obstructs blood flow. This process results in blood changes in the vessels resulting in less oxygen arriving to the rest of the body, making this disorder life-threatening. The severity of the process directly depends on the size of the embolus: a large embolus will block a major lung artery than the one blocked by a smaller embolus. Prevention, correct diagnosis, and early treatment are key factors to reduce the risk of death. It is not considered a disease, but a complication of deep venous thrombosis. 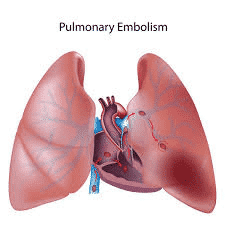 Pulmonary embolism causes cardiovascular death and disability. The Surgeon General of the United States estimates there are 100,000 to 180,000 deaths annually from this disorder and has declared it as the most common preventable cause of death among hospitalized patients. Disabilities produced by chronic thromboembolic pulmonary hypertension and/or post-thrombotic syndrome can exist. An embolism occurs because inflammation long with prolonging clotting factors due to a vessel injury increases the chances of embolus formation. More than 90% of these emboli come from legs due to a deep vein thrombosis (DVT). Clinically, pulmonary embolism is known as “the Great Masquerader” because symptoms and signs are nonspecific, and in many cases, this disorder exists along with an underlying heart or lung disease. Symptoms can start abruptly and be intense. The d-dimer level, which is a breakdown product of clots. This breakdown increases embolism events. This blood test has a 95% accuracy rate. Arterial blood gases will show a decrease in oxygen levels. Cardiac biomarkers or troponin increases due to infarction of the right ventricle. An ECG may show signs of right heart dysfunction, but these are not specific to PE. Chest Xray may show small areas of lung collapse, collections of fluid, raised diaphragms, opacities in lungs and dilated central pulmonary arteries. Ultrasound of the deep venous veins is used to check for blood clots, especially in legs. A CAT of the chest with intravenous contrast is the principal imaging test for the diagnosis of pulmonary embolism. Lung scanning has become a second line diagnostic test, used mostly for patients who cannot tolerate intravenous contrast. Another imaging test is the MR pulmonary angiography. It is used to detect large proximal pulmonary embolism, but it has not been reliable for smaller segmental and subsegmental PE. Echocardiography is a diagnostic tool for detecting conditions that may mimic PE. Pulmonary angiography, an invasive imaging modality, has been replaced by the chest CT with contrast. Is reserved for patients with unsatisfactory chest Cat Scan and for those who have planned an interventional procedure. Blood thinners– An effective anticoagulant therapy is the foundation for a successful treatment of pulmonary embolism. It has to begin even before the diagnosis is confirmed, especially in suspected cases. Heparin-Based therapy is used until the patient gets therapeutic. Then the patient will be switched over to an oral anticoagulant. Depending on the patient´s condition, usually, 3 to 6 months of anticoagulant therapy is ordered. Thrombolysis or fibrinolysis is used because anticoagulant therapy only prevents the new formation of clots, it does not dissolve existing clots. In severe cases, the use of Tissue Plasminogen Activator (tPA), Streptokinase or Urokinase is necessary. These are not used routinely due to a higher risk of bleeding complications. Other techniques like pulmonary embolectomy are less used. Emotional support is necessary for patients that remain with some physical limitations. Prevention of deep vein thrombosis and pulmonary embolism are very similar. It is based on the use of anticoagulants (especially in risky patients), use of compression stockings and legs elevations. Make sure you are engaging in physical activity and eating a healthy diet.